Amitriptyline hydrochloride is a kind of dibenzocycloheptene-derivative tricyclic antidepressant(TCA) and analgesic. The TCAs has similar structure with phenothiazines, containing a tricyclic ring system with an alkyl amine substituent on the central ring. In non-depressed individuals, amitriptyline does not affect mood or arousal, but may cause sedation. In depressed individuals, amitriptyline exerts a positive effect on mood. TCAs take effect through acting as potent inhibitors of serotonin and norepinephrine reuptake. Tertiary amine TCAs such as amitriptyline has a more potent inhibitory effect on serotonin reuptake than secondary amine TCAs, such as nortriptyline. TCAs can also down-regulate cerebral cortical β-adrenergic receptors and sensitize post-synaptic serotonergic receptors with chronic use. The antidepressant effects of TCAs might be related to the overall increase in serotonergic neurotransmission. In addition, TCAs can also block histamine-H1 receptors, α1-adrenergic receptors and muscarinic receptors, which accounts for their sedative, hypotensive and anticholinergic effects (e.g. blurred vision, dry mouth, constipation, urinary retention), respectively. Amitriptyline may be used to treat depression, chronic pain (unlabeled use), irritable bowel syndrome (unlabeled use), diabetic neuropathy (unlabeled use), post-traumatic stress disorder (unlabeled use), and for migraine prophylaxis (unlabeled use). Amitriptyline was one of the first successful antidepressants developed and has been widely used for the treatment of depression since the early 1960s. As early as in 1964, Lance and Curran reported that amitriptyline was effective in tension-type headache independent of the antidepressant effect and a positive effect in migraine was reported in 1973 [2,3]. Thus, amitriptyline is an old, well-known drug not only for the treatment of depression but also for primary headaches. The chemical structure of the tricyclic antidepressant, amitriptyline, is shown in FIGURE 1. Amitriptyline is lipid-soluble and rapidly absorbed after oral administration with peak concentrations achieved after 3–4 h. The bioavilability is relatively low(45%) because of a large first-pass effect. The drug is distributed widely throughout the body and is highly bound to both plasma and tissue proteins. Amitriptyline is mainly metabolized in the liver and the major metabolite, nortriptyline, is pharmacologically active and has also been used for primary headache prophylaxis. Nortriptyline blocks the re-uptake of NE and to a lesser extent 5-HT. Formation of nortriptyline and other metabolites is mediated by cytochrome phosphatase CYP2D6. The half-life of amitriptyline ranges from 13 to 36 h. The metabolites are mainly excreted in the urine. Steady-state plasma concentrations of amitriptyline and nortriptyline are achieved within 7–10 days. Metabolism is slower in elderly patients, which may result in increased plasma concentrations. The pharmacokinetics of amitriptyline is characterized by large interpatient variability and there is no clear relationship between plasma concentrations and analgesic effect. Amitriptyline can interact dangerously with monoamine oxidase (MAO) inhibitors, resulting in hypertensive crisis or serotonin syndrome. Amitriptyline has potentially dangerous interactions with biogenic amines, such as NE, which normally are removed from their site of action by neuronal uptake. L-dopa administered together with amitriptyline increases the risk of hypertension and cardiotoxic effects. Some selective serotonin re-uptake inhibitors, such as fluoxetine and paroxetine and some neuroloptics, compete with amitriptyline for liver metabolism, which may result in toxic plasma concentrations of amitriptyline. Barbiturates and many anticonvulsant agents (particularly carbamazepine) lower plasma concentrations of amitriptyline by increasing hepatic metabolism. The anticholinergic activity of amitriptyline can add to that of antiparkinsonism agents, antipsychotic drugs, or to other compounds with antimuscarinic activity. Amitriptyline can block the centrally mediated antihypertensive action of clonidine. Amitriptyline is indicated for the treatment of the following conditions: major depressive disorder in adults; the management of neuropathic pain in adults, the prophylactic treatment of chronic tension type headache (CTTH) in adults and the prophylactic treatment of migraine in adults. In addition, it is also used for the treatment of nocturnal enuresis in children aged 6 years and above when organic pathology, including spina bifida and related disorders, have been excluded and no response has been achieved to all other non-drug and drug treatments, including antispasmodics and vasopressin-related products. This medicinal product should only be prescribed by a healthcare professional with expertise in the management of persistent enuresis. -Other off-label uses include irritable bowel syndrome, sleep disorders, diabetic neuropathy, agitation and insomnia. Amitriptyline inhibits the presynaptic re-uptake of serotonin(5-HT) and norepinephrine(NE) in the CNS, thus potentiating the activity of these neurotransmitters. 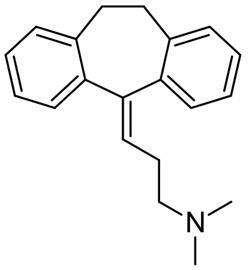 Beyond this, amitriptyline is a potent blocker of muscarinic cholinergic receptors, H1 histamine receptors, α1-adrenergic receptors and several 5-HT receptors, such as, 5-HT2A receptors, while the affinity for α2-adrenergic receptors is low[7,8]. With prolonged treatment amitriptyline may decrease β-adrenergic receptor density and may downregulate or upregulate several receptor systems, such as γ-aminobutyric acid(GABA), adenosine and 5-HT receptors. Moreover, amitriptyline potentiates the effect of endogenous opioids and may act as a N-methyl-D-aspartate(NMDA) receptor antagonist[9,10]. The prophylactic effect of amitriptyline seem unrelated to its antidepressant effect, both in migraine and tension-type headache and it can not be ascribed solely to the inhibition of 5-HT re-uptake because the selective serotonin re-uptake inhibitors are ineffective in headache prophylaxis[21,22,11-13]. It is possible that interaction with 5-HT receptors or blockade of ion channels, such as activated sodium channels, could be of importance in migraine[14–16]. Moreover, an effect on central pain pathways via inhibition of 5-HT and NE re-uptake, potentiation of endogenous opioids, or attenuation of central sensitization via NMDA receptor antagonism could play a role. In tension-type headache, the latter-mentioned effects on central pathways are probably of major importance, but the peripheral analgesic actions of amitriptyline could also play a role[12,13,17–19]. A recent study found that amitriptyline elicits its analgesic effect in chronic tension-type headache by reducing the transmission of painful stimuli from myofascial tissues rather than by reducing overall pain sensitivity. It was suggested that this effect could be caused by a segmental reduction of central sensitization in combination with a peripheral antinociceptive action. Commons side effects include tremors, dizziness, headache, dry mouth, constipation, and nausea. For nervous system, side effects may include Ataxia, disturbance in attention, dizziness, dysarthria/speech disorders, dysgeusia, drowsiness, headache, paresthesia, somnolence, tremors, convulsions, akathisia and polyneuropathy. Cardiovascular diseases may include atrioventricular(AV) block, bundle branch block, electrocardiogram(ECG) abnormal, electrocardiogram QRS complex prolonged, electrocardiogram QT prolonged, orthostatic hypotension, palpitations, tachycardia, collapse conditions, hypertension, worsening of cardiac failure. Gastrointestinal side effects may include constipation, diarrhea, dry mouth, nausea, tongue edema and vomiting. Respiratory side effects may include allergic inflammation of the pulmonary alveoli, allergic inflammation of the lung tissue, alveolitis, congested nose and Loffler's syndrome. Psychiatric side effects may include aggression, agitation, confusional states and libido decrease. Metabolic side effects may include hyponatremia, thirst, weight increase. Amitriptyline should be administered with caution in patients with urinary retention, prostatic hypertrophy, increased ocular pressure, narrow angle glaucoma, constipation, impaired liver function, or cardiovascular disease and with care in elderly patients because of the anticholinergic effects. It should be avoided in patients with heart block, arrhythmias, immediately after myocardial infarction, in those with urinary retention, or severe liver disease and during pregnancy and breastfeeding. Overdosage with amitriptyline can produce coma, seizures, hypertension, electrocardiographic abnormalities and arrhythmias. Death from amitriptyline overdosage is primarily due to cardiac arrest. This is of great concern when treating patients with depression but less often a problem when treating primary headaches. Serious adverse events may be seen after intake of 10–15 mg amitriptyline per kg of bodyweight. Lance JW, Curran DA. Treatment of chronic tension headache. Lancet 1, 1236–1239 (1964). Gomersall JD, Stuart A. Amitriptyline in migraine prophylaxis. Changes in pattern of attacks during a controlled clinical trial. J. Neurol. Neurosurg. Psychiatry 36, 684–690 (1973). Silberstein SD. Practice parameter: evidence-based guidelines for migraine headache (an evidence-based review): report of the Quality Standards Subcommittee of the American Academy of Neurology. Neurology 55, 754–762 (2000). Bryson HM, Wilde MI. Amitriptyline. A review of its pharmacological properties and therapeutic use in chronic pain states. Drugs Aging 8, 459–476 (1996). Weber S. Drug interactions with antidepressants. CNS Special Edition 1, 47–55 (1999). Frazer A. Pharmacology of antidepressants. J. Clin. Psychopharmacol. 17, 2S–18S (1997). Westenberg HG. Pharmacology of antidepressants: selectivity or multiplicity. J. Clin. Psychiatry 60(Suppl. 17), 4–8 (1999). Botney M, Fields HL. Amitriptyline potentiates morphine analgesia by a direct action on the central nervous system. Ann.Neurol. 13, 160–164 (1983). Watanabe Y, Saito H, Abe K. Tricyclic antidepressants block NMDA receptormediated synaptic responses and induction of long-term potentiation in rat hippocampal slices. Neuropharmacology 32, 479–486 (1993). Couch JR, Hassanein RS. Amitriptyline in migraine prophylaxis. Arch. Neurol. 36, 695–699 (1979). Ziegler DK, Hurwitz A, Hassanein RS, Kodanaz HA, Preskorn SH, Mason J. Migraine prophylaxis. A comparison of propranolol and amitriptyline. Arch. Neurol. 44, 486–489 (1987). Bendtsen L, Jensen R, Olesen J. A nonselective (amitriptyline) but not a selective (citalopram), serotonin re-uptake inhibitor is effective in the prophylactic treatment of chronic tension-type headache. J. Neurol. Neurosurg. Psychiatry 61, 285–290 (1996). Goadsby PJ. How do the currently used prophylactic agents work in migraine? Cephalalgia 17, 85–92 (1997). Terron JA. Is the 5-HT(7) receptor involved in the pathogenesis and prophylactic treatment of migraine? Eur. J. Pharmacol. 439, 1–11 (2002). Bendtsen L. Sensitization: its role in primary headache. Curr. Opin. Investig. Drugs 3, 449–453 (2002). Cerbo R, Barbanti P, Fabbrini G, Pascali MP, Catarci T. Amitriptyline is effective in chronic but not in episodic tension-type headache: pathogenetic implications. Headache 38, 453–457 (1998). Sawynok J, Reid AR, Esser MJ. Peripheral antinociceptive action of amitriptyline in the rat formalin test: involvement of adenosine. Pain 80, 45–55 (1999). Bendtsen L, Jensen R. Amitriptyline reduces myofascial tenderness in patients with chronic tension-type headache. Cephalalgia 20, 603–610 (2000). Ramadan NM, Schultz LL, Gilkey SJ. Migraine prophylactic drugs: proof of efficacy, utilization and cost. Cephalalgia 17, 73–80 (1997). Mathew NT, Bendtsen L. Prophylactic pharmacotherapy of tension-type headache. In: The Headaches. 2 ed. Olesen J, Tfelt-Hansen P, Welch KM (Eds). Lippincott, Williams and Wilkins, MD, USA, 667–673 (2000). Amitriptyline, 3-(10,11-dihydro-5H-dibenzo[a,d]cyclohepten-5-ylidene)-N,N-dimethyl-1-propanamine hydrochloride,5-(3-dimethylaminopropylidene)-10,11-dihydro-5Hdibenzo[a,d]cycloheptene hydrochloride (Elavil), is one ofthe most anticholinergic and sedative of the TCAs. Becauseit lacks the ring-electron–enriching nitrogen atom ofimipramine, metabolic inactivation mainly proceeds not at theanalogous 2-position but at the benzylic 10-position (i.e.,toluene-like metabolism predominates). Because of the 5-exocyclic double bond, E- and Z-hydroxy isomers are producedby oxidation metabolism. Conjugation produces excretablemetabolites. As is typical of the dimethyl compounds,N-demethylation occurs, and nortriptyline is produced, whichhas a less anticholinergic, less sedative, and more stimulantaction than amitriptyline. Nortriptyline is a SNERI; thecomposite action of drug and metabolite is nonselective. Poison by ingestion, intraperitoneal, intravenous, and subcutaneous routes. Human systemic effects by ingestion: convulsions, respiratory depression, changes in sleep, hallucinations, muscle contractions, somnolence, blood pressure decrease, coma, cyanosis, dyspnea, and ataxia. An experimental teratogen. Other experimental reproductive effects. Mutation data reported. Used in the treatment of depression. When heated to decomposition it emits very toxic fumes of HCl and NOx. See also ELAVIL. 549-18-8 US $10.00 / KG 10G 99% 10MT Hubei XinRunde Chemical Co., Ltd.
Tricyclic antidepressant; inhibits the norepinephrine and serotonin transporters with Kis of 100 nM and 14.7 nM, respectively; high in vitro affinity for alpha1-adrenoceptors, serotonin and muscarinic acetylcholine receptors.